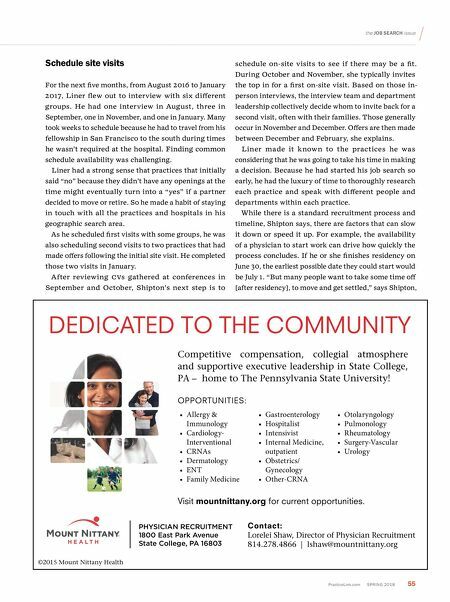 54 S PRIN g 2018 PracticeLink.com features You became a physician to provide exceptional patient care. You want to practice where your needs also receive personal care and attention. You belong at Banner Medical Group. As Banner Health's employed physician group with over 1,000 physicians across more than 65 specialties, BMG is transforming the delivery of care – and the way physicians practice medicine. We can help make your practice more perfect. You've dedicated your life to delivering high quality care to your patients – not to deal with paperwork, insurance companies and staffing issues. By aligning yourself with our physician- focused organization, you'll be in an ideal position to keep taking great care of your current patients while you enjoy the ability to expand your practice and eliminate many of the unwanted challenges of private practice. As part of Banner Health, we can also give you greater financial stability in your practice as well as consistent compensation and comprehensive benefits. We value your life away from work. As part of Banner Medical Group, you'll have access to an unmatched variety of career and lifestyle options. With locations around the west in Alaska, Arizona, California, Colorado, Nebraska, Nevada and Wyoming, you'll have a choice of varied and rewarding places to work, live and play. Make the move today. Banner Medical Group offers consistent, attractive compensation and an excellent benefits package. 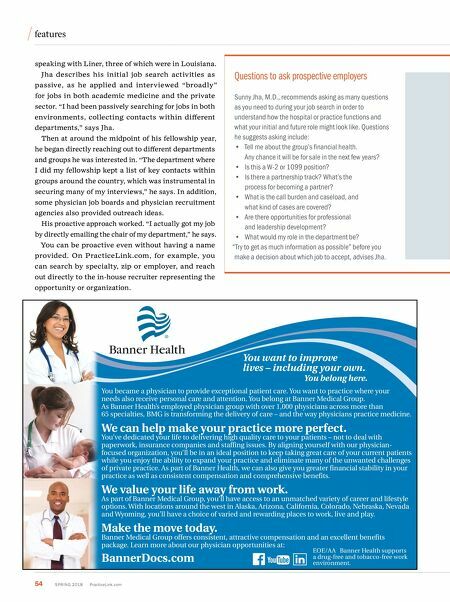 Learn more about our physician opportunities at: BannerDocs.com You want to improve lives – including your own. You belong here. EOE/AA Banner Health supports a drug-free and tobacco-free work environment. speaking with Liner, three of which were in Louisiana. Jha describes his initial job search activities as passive, as he applied and interviewed "broadly" for jobs in both academic medicine and the private sector. "I had been passively searching for jobs in both environments, collecting contacts within different departments," says Jha. Then at around the midpoint of his fellowship year, he began directly reaching out to different departments and groups he was interested in. "The department where I did my fellowship kept a list of key contacts within groups around the country, which was instrumental in securing many of my interviews," he says. In addition, some physician job boards and physician recruitment agencies also provided outreach ideas. His proactive approach worked. "I actually got my job by directly emailing the chair of my department," he says. You can be proactive even without having a name provided. On PracticeLink.com, for example, you can search by specialty, zip or employer, and reach out directly to the in-house recruiter representing the opportunity or organization. Questions to ask prospective employers Sunny Jha, M.D., recommends asking as many questions as you need to during your job search in order to understand how the hospital or practice functions and what your initial and future role might look like. Questions he suggests asking include: • Tell me about the group's financial health. Any chance it will be for sale in the next few years? • Is this a W-2 or 1099 position? • Is there a partnership track? What's the process for becoming a partner? • What is the call burden and caseload, and what kind of cases are covered? • Are there opportunities for professional and leadership development? • What would my role in the department be? "Try to get as much information as possible" before you make a decision about which job to accept, advises Jha.